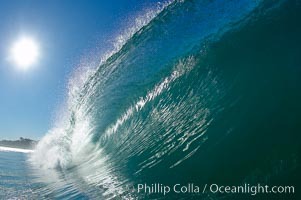 Breaking wave, fast motion and blur. The Wedge. Portfolio Photo. Blue whale underwater closeup photo. This picture of a blue whale, the largest animal ever to inhabit earth, shows it swimming through the open ocean, a rare underwater view. 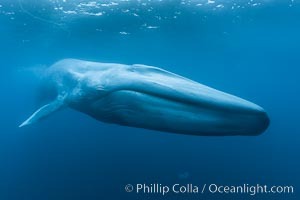 Since this blue whale was approximately 80-90' long and just a few feet from the camera, an extremely wide lens was used to photograph the entire enormous whale. Portfolio Picture. 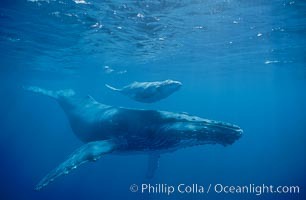 North Pacific humpback whales, a mother and calf pair swim closely together just under the surface of the ocean. The calf will remain with its mother for about a year, migrating from Hawaii to Alaska to feed on herring. Stock Photography of Portfolio. North Pacific humpback whale, breach. Photograph of Portfolio. 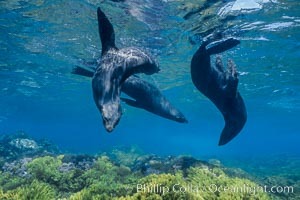 Guadalupe fur seals, floating upside down underwater over a rocky reef covered with golden kelp at Guadalupe Island. Portfolio Photos. 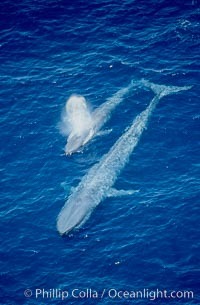 Two blue whales, a mother and her calf, swim through the open ocean in this aerial photograph. The calf is blowing (spouting, exhaling) with a powerful column of spray. 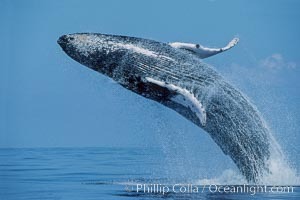 The blue whale is the largest animal ever to live on Earth. Portfolio Image. 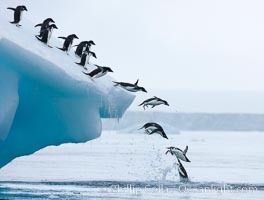 Adelie penguins leaping into the ocean from an iceberg. Professional stock photos of Portfolio. 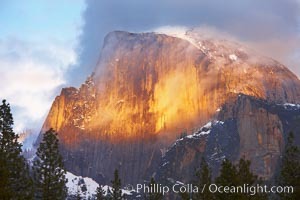 Half Dome and storm clouds at sunset, viewed from Sentinel Bridge. Pictures of Portfolio. 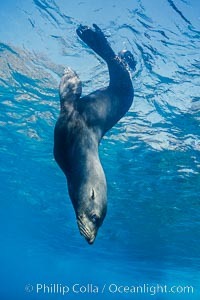 Guadalupe fur seal, floating upside down under the ocean's surface at Guadalupe Island, watching the photographer and looking for passing predators. Portfolio Photo. 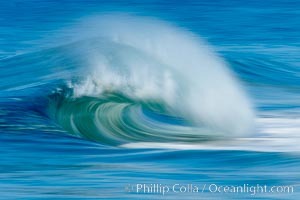 Breaking wave, Moonlight Beach, Encinitas, morning, barrel shaped surf, California. Portfolio Picture. 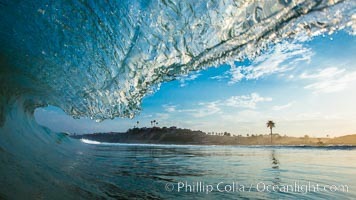 Breaking wave, Ponto, South Carlsbad. Stock Photography of Portfolio. Brown pelican in flight. The wingspan of the brown pelican is over 7 feet wide. 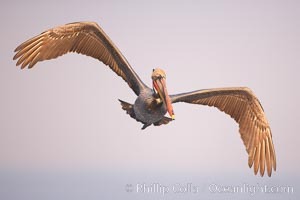 The California race of the brown pelican holds endangered species status. In winter months, breeding adults assume a dramatic plumage. Photograph of Portfolio. Male elk bugling during the fall rut. 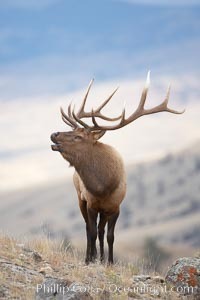 Large male elk are known as bulls. Male elk have large antlers which are shed each year. Male elk engage in competitive mating behaviors during the rut, including posturing, antler wrestling and bugling, a loud series of screams which is intended to establish dominance over other males and attract females. Portfolio Photos. 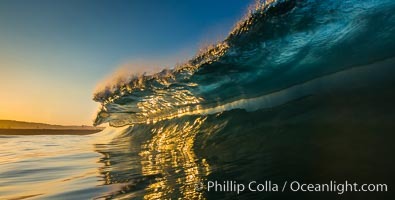 Sunrise glints yellow on breaking wave, dawn surf. Portfolio Image. 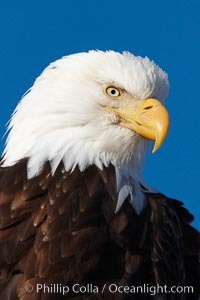 Bald eagle, closeup of head and shoulders showing distinctive white head feathers, yellow beak and brown body and wings. Professional stock photos of Portfolio. 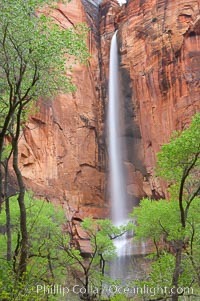 Waterfall at Temple of Sinawava during peak flow following spring rainstorm. Zion Canyon. Pictures of Portfolio. 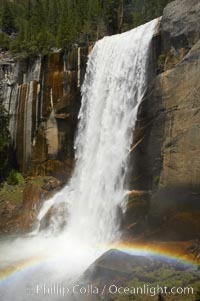 Vernal Falls at peak flow in late spring, with a rainbow appearing in the spray of the falls, viewed from the Mist Trail. Portfolio Photo. 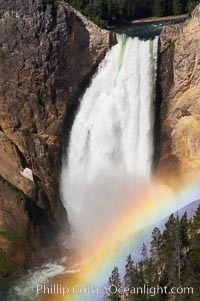 A rainbow appears in the mist of the Lower Falls of the Yellowstone River. At 308 feet, the Lower Falls of the Yellowstone River is the tallest fall in the park. This view is from Lookout Point on the North side of the Grand Canyon of the Yellowstone. When conditions are perfect in midsummer, a midmorning rainbow briefly appears in the falls. Portfolio Picture. Grand Prismatic Spring (left) and Excelsior Geyser (right). Grand Prismatic Spring displays a stunning rainbow of colors created by species of thermophilac (heat-loving) bacteria that thrive in narrow temperature ranges. The blue water in the center is too hot to support any bacterial life, while the outer orange rings are the coolest water. 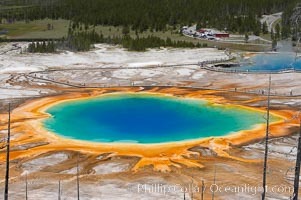 Grand Prismatic Spring is the largest spring in the United States and the third-largest in the world. Midway Geyser Basin. Stock Photography of Portfolio. 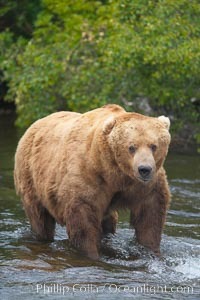 A large, old brown bear (grizzly bear) wades across Brooks River. 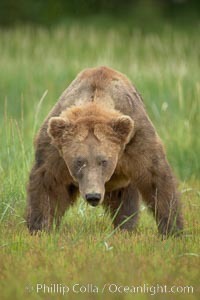 Coastal and near-coastal brown bears in Alaska can live to 25 years of age, weigh up to 1400 lbs and stand over 9 feet tall. Photograph of Portfolio. Mesa Arch, Utah. 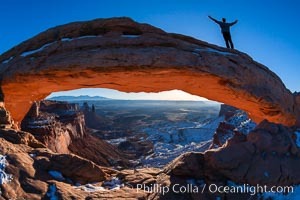 An exuberant hiker greets the dawning sun from atop Mesa Arch. Yup, that's me. Portfolio Photos. Full grown, mature male coastal brown bear boar (grizzly bear) in sedge grass meadows. Portfolio Image. A great white shark opens it mouth just before it attacks its prey with a crippling, powerful bite. After the prey has been disabled, the shark will often wait for it to weaken from blood loss before resuming the attack. 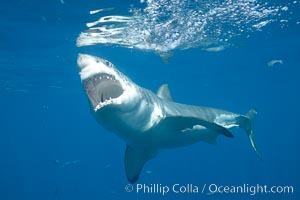 If the shark looses a tooth in the course of the bite, a replacement just behind it will move forward to take its place. Professional stock photos of Portfolio. 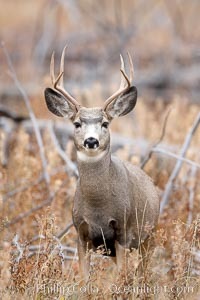 Mule deer in tall grass, fall, autumn. Pictures of Portfolio. Kelp frond showing pneumatocysts. Portfolio Photo. A whale shark swims through the open ocean in the Galapagos Islands. 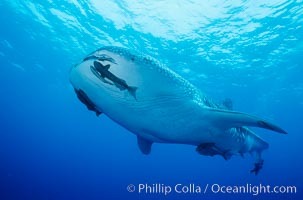 The whale shark is the largest shark on Earth, but is harmless eating plankton and small fish. Portfolio Picture. 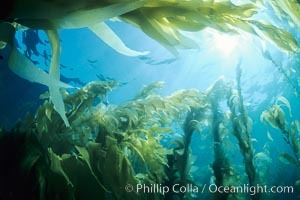 A kelp forest, with sunbeams passing through kelp fronds. 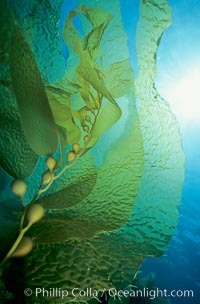 Giant kelp, the fastest growing plant on Earth, reaches from the rocky bottom to the ocean's surface like a submarine forest. Stock Photography of Portfolio. 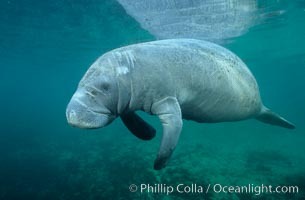 A Florida manatee, or West Indian Manatee, swims slowly through the clear waters of Crystal River. Photograph of Portfolio. 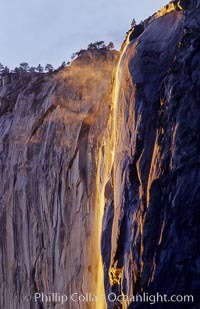 Horsetail Falls backlit by the setting sun as it cascades down the face of El Capitan, February, Yosemite Valley. Portfolio Photos. 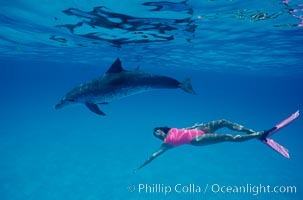 Atlantic spotted dolphin, Olympic swimmer Mikako Kotani. Portfolio Image.